The Guardian asks: what is the role of art in sustainability? 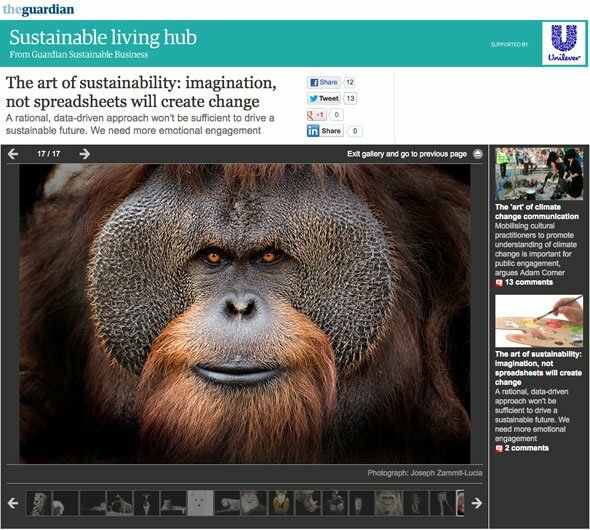 “So, what is the role of art in sustainability?,” asks the editor of The Guardian’s environment section, as the British newspaper highlights a collection of animal portraits by Joseph Zammit-Lucia, and the accompanying article where Zammit-Lucia argues that for a truly sustainable future, we need more artists, novelists and musicians in the business world. “The rational, data-driven approach tends to keep us stuck in the past and the present, reducing sustainability to mere extrapolation. We reduce the amount of packaging around a product and call it sustainable. We make something out of recycled material and we call it sustainable. We jig our supply chain around and call it sustainable. Yet none of this will be sufficient to deliver a sustainable future. It will simply prolong very slightly the time it takes to hit the wall. Culture|Futures is an international collaboration of organizations and individuals who are concerned with shaping and delivering a proactive cultural agenda to support the necessary transition towards an Ecological Age by 2050. The Cultural sector that we refer to is an interdisciplinary, inter-sectoral, inter-genre collaboration, which encompasses policy-making, intercultural dialogue/cultural relations, creative cities/cultural planning, creative industries and research and development. It is those decision-makers and practitioners who can reach people in a direct way, through diverse messages and mediums. Affecting the thinking and behaviour of people and communities is about the dissemination of stories which will profoundly impact cultural values, beliefs and thereby actions. The stories can open people’s eyes to a way of thinking that has not been considered before, challenge a preconceived notion of the past, or a vision of the future that had not been envisioned as possible. As a sector which is viewed as imbued with creativity and cultural values, rather than purely financial motivations, the cultural sector’s stories maintain the trust of people and society.